Will Airbnb Ever Be "The Airbnb For X"? The collaborative consumption space, which basically includes almost all marketplace startups that provide accoutrements like payment and reputation platforms for users who want to buy and sell from each other, is SO HOT RIGHT NOW. As Forbes writer Nicole Perlroth put it, “The Airbnb of office space!, The Airbnb of tutoring! Airbnb for cars! And my personal favorite, Airbnb for experiences!” (Note: I am probably the worst this offender on the TC team). Airbnb seems to be the one that got away for many investors, who are now closely watching the roster of startups that are slowly disrupting certain sections of Craigslist (and in the case of Airbnb, doing this literally). With over 60K listings on the site and 50% bookings growth monthly, its no surprise that the pioneering peer to peer accommodations marketplace is raising 100 million in funding. And its no surprise that collaborative consumption startups like Taskrabbit, Vayable, Skyara, Tutorspree and Getaround and others are also generating buzz and cash. And where users go investors follow. Scorpio tells me that she feels that investors are more likely to invest in Getaround because of the success of Airbnb. “We couldn’t wrap our heads around air mattresses on the living room floors as the next hotel room and did not chase the deal. Others saw the amazing team that we saw, funded them, and the rest is history. Airbnb is well on its way to building the ‘eBay of spaces.’ I’m pretty sure it will be a billion dollar business in time [Editor’s note: Good call Fred]. And perhaps Airbnb itself will save us the pain of having to use “Airbnb for X” repeatedly in headlines? In an interview Brian Chesky did with Om Malik in February (when the pressure of a $1 billion valuation wasn’t so high) he alludes to his company expanding into other verticals. 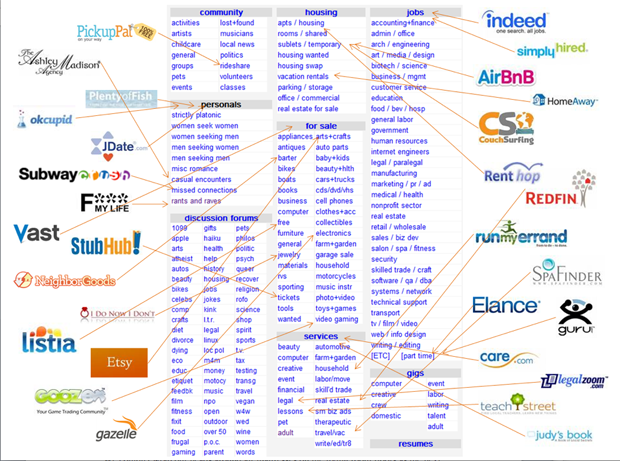 It’s easy to talk about an expanded vision, and hint that your company will enter other categories in 2011, but it remains to be seen whether the practical execution of “entering other verticals” in this case means either acquiring or getting into the markets of other collaborative consumption startups or just limiting your model to lodgings (the company plans on launching sublets soon). Chesky told me in an email, “We think that this new economy of consumption, which Airbnb pioneered, will eventually consolidate into a few marketplaces, rather than having the ‘Airbnb for’ hundreds of categories.” When repeatedly asked the (pretty annoying) ‘Does Airbnb want to become the Airbnb of X?’ question marketing director Chris Lukezic told me that company is currently focused squarely on accommodation and wouldn’t elaborate further. Fair enough. They’ve a hard time enough making sure all those headline writers aren’t spelling it “AirBnb” (true story). In the meantime, please leave your suggestions for alternate ways of writing “The Airbnb Of” in our headlines, in the comments.